You most probably know how to do this, mention someone properly in a Facebook post. But you’d be surprised that there are million and one others who have no idea why, how and when to mention someone in a Facebook post. Personally I have been surprised just how clueless some Facebook users are when it comes to basic Facebook features like Facebook mentions. A few weeks ago I tried to enlighten these Facebookers on some other Facebook features like how to prevent people from tagging you on pictures without your permission. An attempted mentioning ends up in tagging. Tagging is important in certain aspects, but when you want to call out a name of a friend in a post or comment, the feature one should use is mentions, not tagging. An attempted mentioning is done with the # symbol. # Symbol in Facebook does not mention someone but tags that name into a hashtag, the same way it works on Twitter. That is, if you click on a name with a # preceding it, Facebook will take you to posts with the same hashtag instead of directing you to the Facebook timeline of the person that should have been mentioned. An attempted mentioning ends up being plain, unbolded unclickable name just like the rest of the texts in that Facebook update. There are at least three reasons why you should know how to mention someone properly on a Facebook post or comment. The obvious one is so that you draw their attention to the post or comment. This is because every time you mention someone on Facebook, Facebook not only sends them immediate notification that they have been mentioned, but also follows that notification with an email alert – doesn’t matter whether or not the person mentioned has disabled email alerts for Facebook notifications. The second reason is so that when writing a post about a particular friend, you are able to within the post mention that friend. Lastly you should mention someone properly on Facebook to acknowledge/credit their original works. For example you may have copy pasted a friend’s Facebook status update, and the best way to acknowledge that would be to mention them in a post as the original author. I for one find this most appropriate as the friend will not only be alerted, but your friends will also be enabled to visit the friend’s timeline and check the friend out. I personally find this approproach more appealing compared to just sharing the post. First of all, sharing a friend’s post notifies them that their post has been shared, but Facebook does not tell them who shared the post. Secondly, shared posts are displayed to very few friends, whereas copy pasted posts are treated as though they are your original updates and as such will be displayed to several of your Facebook friends. The last reason is the main reason for me, as I would like photographs taken by me to receive properly credits that I am the photographer. Actually asking my models to mention me properly on their pictures taken by me is what led me to discover that very few Facebook users actually know how to mention someone in a Facebook post or comment. Now that you know why it is important to mention someone properly in a Facebook post or comment, this is how to do it. Step 1 – Click on Update Status in your Facebook. Ensure you have a fast Internet connection for this to work seamlessly. Step 2 – Start typing the Facebook name of the person you want to mention. This means you should know how they have called themselves in Facebook. Avoid typos as misspelling the name will mean you either get no one to mention or end up mentioning the wrong person. Step 2 Alt – If Step 2 doesn’t bring up the name of the person in a drop down list so that you can click to place the name in your status update, then delete the name you had typed but this time round start typing with @ Symbol preceding the name. 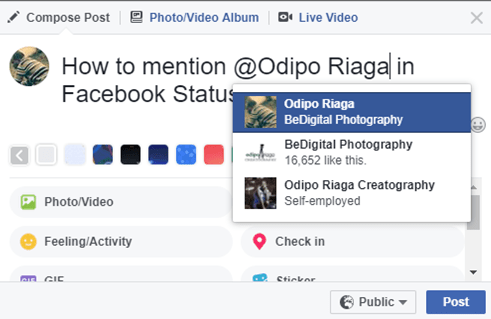 For example, if you wanted to mention me on Facebook but after typing in Odipo Riaga Facebook has not brought to you my name in a drop down list, you can delete the name and retype as @Odipo Riaga. This should work even if we are not friends on Facebook. Step 3 – Choose the name of the person you are mentioning from a list of suggestions in a drop down list. See image below for illustrations. As the above image illustrate, typing in @Odipo Riaga in your Facebook status update will bring in three Facebook accounts all of which are related to me. You would however have to choose the first one as that’s the official personal Facebook account. The second is my photography page whereas the last is an account strictly used for photography business. There are instances where mentioning someone on Facebook does not work. These are instances that sometimes I personally cannot understand, instances where you have slow Internet, or when you are using the wrong Facebook App. For example those on Microsoft OS may find it hard to mention their friends on Facebook. In such cases, I always advise people to try Facebook on the web. And that, is how to mention someone in a Facebook post.